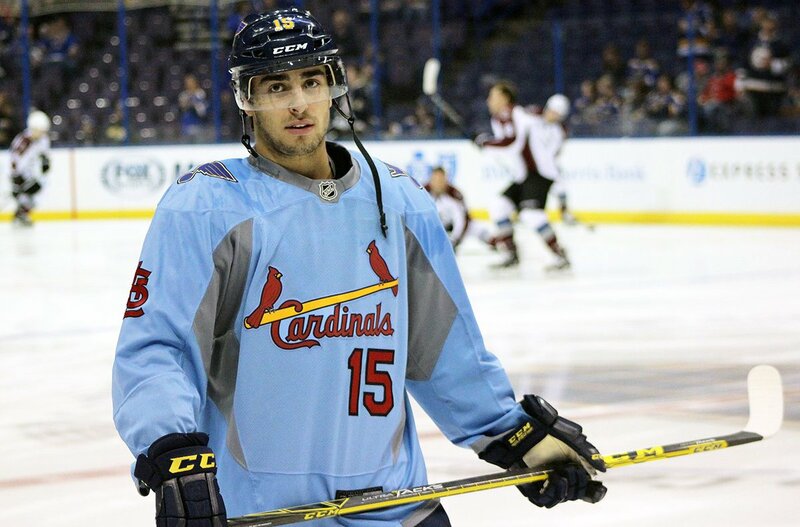 The Blues and the Cardinals haven’t been shy about collaborating on a host of different projects over the last few years. 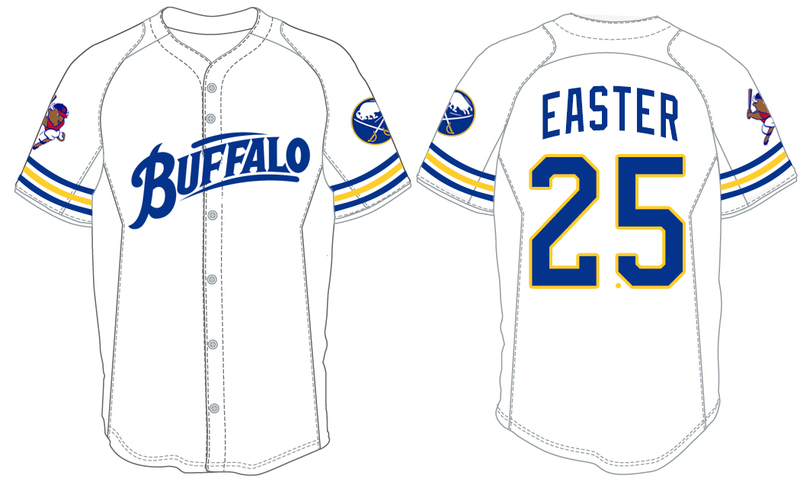 Their partnership has been particularly strong since the departure of the Rams and one of the coolest things they’ve collaborated on are crossover jerseys. Lately both teams have adorned their neighbor’s logo for a day each year and the Cards will be offering up a promotional version for 2018, with a cool away uniform design. It’s a cool giveaway which would probably even garner attention as a retail item. On this week’s episode Chris and Tyler run down the decision and potential consequences by the NHL to not send players to the 2018 Winter Games. We discuss the potential impact on the growth of the game overseas and the consequences closer to home. Also on the agenda is the poor giveaway offered by the Sabres for this year’s Fan Appreciation Night and the additional opportunities the Sabres miss when it comes to fan engagement, giveaways and promotions. 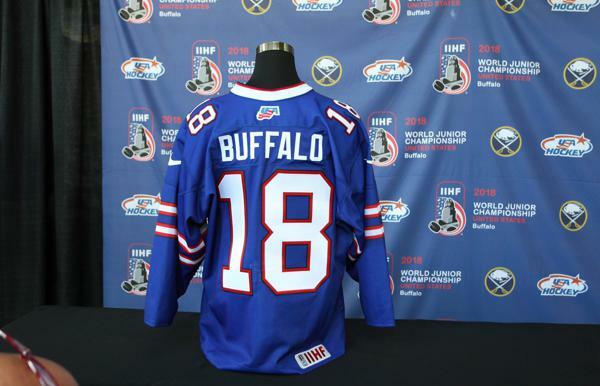 The Sabres announced April will serve as Fan Appreciation Month in a step to give back to their fans for laboring through a 30th place season. A number of giveaways and discounts aimed at the fans and it appears that the first of which will come tonight prior to their game against New Jersey. It’s a nice step to take as the Sabres are extending a practice that they’ve utilized since Terry Pegula first took over. Outside of the fan handout on Tuesday, April 1, I’m not sure there’s anything that makes the game an event you can’t miss. Exactly what that fan handout is hasn’t yet been explained. Everything else just sort of exists. The Sabres could certainly do better and after such a dismal season it would go a long way to show the fans that management still cares. Perhaps the Sabres are still holding their big cards for more successful seasons but I’d still like to see something unique done in the near future in the form of a fan giveaway. One idea that immediately came to mind was a series of goal masks throughout the history of the franchise. While doing one mask a year wouldn’t be very feasible (something tells me a 15-year giveaway series wouldn’t work in the NHL). However they could certainly do between three and five a year and run up a pretty neat collection for their fans. All it would take, I’d assume, is to make contact with the player and the person who painted their mask to ensure they had a release for the artwork. Upper Deck has done it previously with mini mask collections and the Sabres could mimic that in their own way. I’d say a five-inch tall mask would be perfect, although that’s pretty large. I have a pretty decent list of masks that would have to be included in any sort of collection that will be presented here in no particular order. Dominik Hasek. This is an obvious choice and I’d prefer to go with the basic black with just the B alternate logo on the side, but this version is more visually appealing. 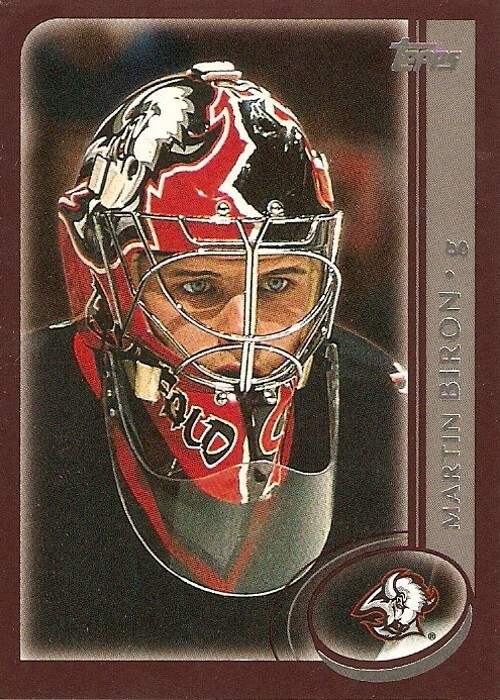 Martin Biron’s half-and-half helmet was probably the most iconic one that he wore in Buffalo besides the Amerks mask he donned when he finally earned a permanent role. In fact, I’d love to see that Americans mask included in this type of collection. Ryan Miller is sort of a no brainer. They could include his Olympic mask too, but considering he’s so recently departed it may be overkill. I’m a huge fan of Grant Fuhr’s longhorn skull mask. I’d love to see this one done. 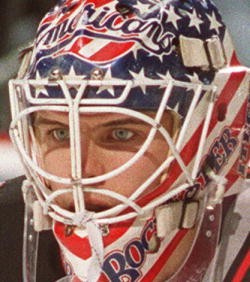 Gerry Desjardins had a very cool mask design that would be a must to include. Steve Shields wore a very dark mask that was hard to distinguish but I was a huge fan of it. He had another, less cool one as well. Obviously with Jhonas Enroth and Michal Neuvirth being the team’s current goaltenders it would make sense to include both of them in the collection. You can certainly take your pick considering Enroth’s artwork changes each year while Neuvirth’s will be an easy choice. Additional goaltenders that would be worth including would be Roger Crozier, Tom Barrasso, Bob Sauve and Don Edwards among others. It comes down to honoring the goalies who most deserve it (those with the most games played, wins, etc.) or those whose masks have the best artwork. My list leans towards the latter as they’re simply better collectors items than blank masks like Sauve’s and Edwards’ that would probably be very hard to duplicate. This is just one somewhat goofy idea of the many I cook up throughout the day that I thought would be fun to share. 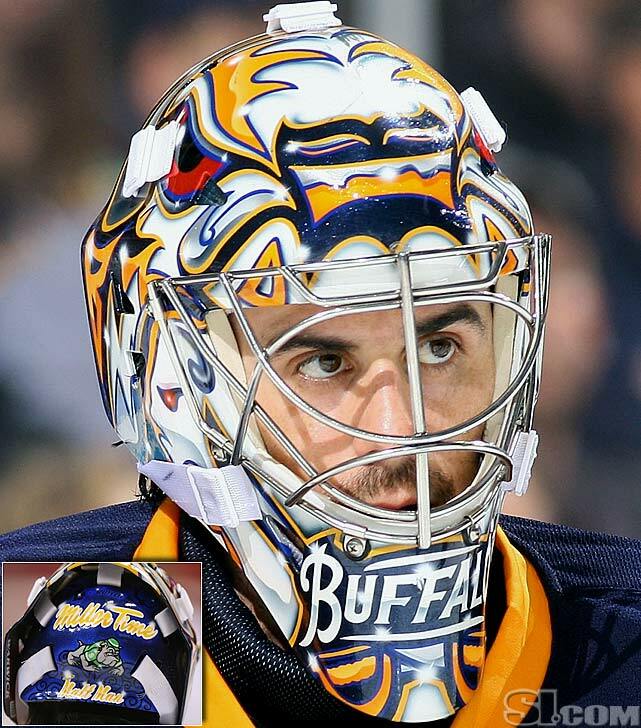 A great many Sabres netminders wore some very cool masks and creating a series of fan giveaways with them could be very cool. Or a local retailer could take up the banner and prepare to take my money.